Home > Fire Safety & EMS > Fire Safety Evacuation Supplies & Tools > Fire Extinguisher Arrow Signs > Vinyl Self-Adhesive Fire Alarm Arrow Sign - 8" x 12"
Home > Fire Safety & EMS > Fire Extinguisher Arrow Signs > Vinyl Self-Adhesive Fire Alarm Arrow Sign - 8" x 12"
Home > Fire Extinguisher Arrow Signs > Vinyl Self-Adhesive Fire Alarm Arrow Sign - 8" x 12"
Vinyl Self-Adhesive Fire Alarm Arrow Sign - 8" x 12"
These 8" x 12" Fire Alarm Signs with down arrow are silk screened using fade resistant UV inks on adhesive vinyl and laminated. 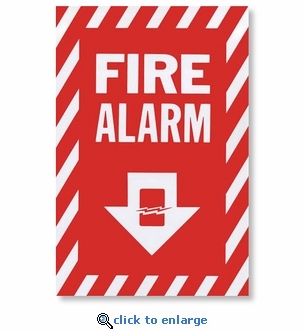 These peel and stick fire alarm signs will ensure your fire alarm locations are clearly marked. For orders of 25 or more select UPS Ground for the best shipping rate. 3D Angle Rigid Plastic Fire Extinguisher Arrow Sign - 4" x 12"
3D Angle Rigid Plastic Fire Extinguisher Arrow Sign Pictogram - 5" x 6"